Glennwilde’s Grand Opening Offers New Homes from Only $689 Per Month! Nestled off I-10 in the Southeast Valley of Phoenix, Glennwilde is celebrating its Grand Opening. With homes starting as low as $689 per month, Glennwilde is one of the most affordable new home communities in the Southeast Valley. Residents of the Glennwilde community will enjoy top-notch recreation with a family friendly atmosphere, and will rest easy in some of the highest quality houses in the state of Arizona. Glennwilde is a new home community in the Phoenix-metro area that features new homes priced from as little as $689 per month. Prospective residents at Glennwilde have the ability to choose from a wide variety of modern floor plans, including 3, 4 and 5 bedroom, 2 bathroom homes. Both single- and two-story floor plans are available, making it easy to find the perfect home to suit your family’s needs. All homes come complete with a 2-car garage and $15,000 worth of luxury, state-of-the-art upgrades included in the cost of the home, making our homes an unbeatable deal in terms of both price and quality. Upgrades include quality appliances (including a brand new refrigerator), maple cabinets, raised 2-panel doors, granite counter tops, upgraded trim, covered patios, a fully fenced backyard, a utility room, front yard landscaping and LGI Homes homeowner warranty. LGI Homes offers one of the best warranty plans available, including a 10-year structural warranty, a 2-year mechanical warranty and a 1-year warranty on most other components. When it comes to recreation and amenities, few communities in the Southeast Valley area can compete with what Glennwilde has to offer. There are several neighborhood parks and a children’s playground, as well as a community pool to help you cool off in the hot summer heat. Nature enthusiasts will love the greenbelt areas and walking trails spread throughout the community, and families with school-aged children will be happy to know that Glennwilde is home to some of the best schools in the county. For residents who love to fish, Glennwilde is conveniently located near a catch and release lake. With LGI Homes No Money Down Option, you will find it is less expensive to move into your dream home in Glennwilde community than it is to move into an apartment. 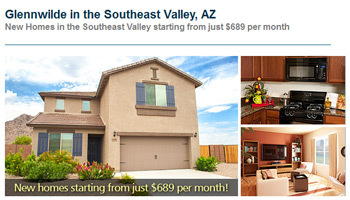 If you are looking at new homes in the Southeast Valley area you owe it to yourself to take a look at Glennwilde, where LGI Homes’ exceptional quality, affordable pricing, and unbeatable customer service make this the perfect place for you and your family!